Is everyone here? You, in the back, can you hear me? Ok, just follow me…see this red flag I’m holding, if you don’t see me, just look for that red flag. Right this way! The Gelato Tour doesn’t have a long and storied history, but as time goes on I have no doubt it will. 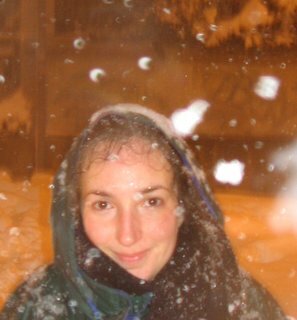 Sara, aka Ms. Adventures in Italy, is our fearless leader, and you can go on other tours here. I am one of your trusty tour guides for Rome, and while our first stop today isn’t necessarily my absolute favorite gelato place (there are so many and my true favorite isn’t that close to my house, so we’ll have to go there another day), it is definitely the winner in my book for sheer number of choices. I give you: Della Palma, just steps from the Pantheon, an area where there's quite a bit of competition for your gelato money. So it's a good thing you have a tour guide to help you wade through the Roman gelato jungle. 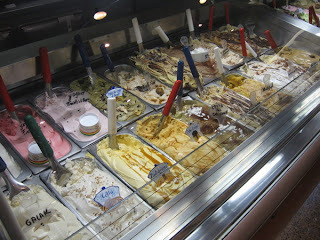 I took four shots of the glass cases of gelato here, and I still hadn’t covered all of them. It’s usually full of tourists, but I managed to stop by when there was hardly anyone, which was perfect for getting all my photographic evidence. By the fourth or fifth shot though, the guy serving gelato was so amused that I decided I better order something. I got the smallest cone, giving me a choice of two flavors, so I picked biscotto and Galak (a white chocolate named after a candy bar here). The biscotto tasted like cookies and cream, which I loved, because it isn’t that easy to find. The best thing about Della Palma is that if you have a favorite gelato flavor and you can hardly ever find it, chances are good that it’s here. I didn’t ask how many flavors they have or count, although a list on Fodor’s says one hundred (seems a strangely round number, but it’s probably pretty close). One of the only drawbacks to this place is the fact that it’s a little pricey. I didn't write down the prices, but I think I paid €2.50 for a small cone, which is about 1 euro more than what I'm used to. Most of the places around the Pantheon are higher, because they obviously cater to tourists. While we’re on the topic, be sure to look at the price list before ordering at shops in these touristy areas, and if there isn’t a price list displayed (although that’s technically against the law), be sure to ask how much a small cone, or a cone with the number of flavors you want, costs. Once one of my study abroad students told me that she was charged €5 for a small cone, and was only told the price after it was being held out to her, dripping. It’s a bit uncomfortable at that point to start arguing that you’re being ripped off. However, if that had happened to me, I would have told the guy thanks anyways and let him eat the gelato. As I always say, don’t be afraid to refuse things if you feel you’re being ripped off. A small gelato (meaning 2-3 flavors depending on the shop) should run you anywhere from €1.50 to €2.50. Even if its higher, it's OK so long as you know that's the price before you order. Pay first, or at least ask, then order. In addition to “regular” gelato, Della Palma offers variations on the theme, like mousse in several flavors (though only available in a cup, not a cone, because it doesn't have the same consistency as gelato). 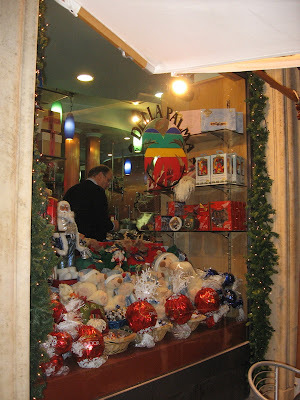 It’s also a candy store, so could be a good place to pick up some goodies for friends and family, or just for yourself. And I’m not the only one who likes this place. 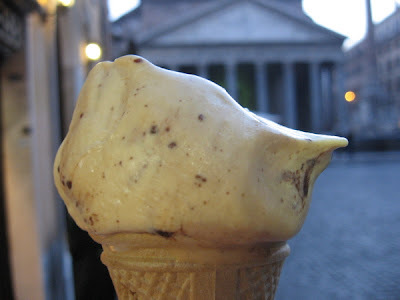 As we wind up today’s visit, I’d like to have you take a look at Fodor’s list of the best gelato in Rome. First, I can assure you that my favorite gelato place is not on the list, and that’s because it’s not touristy. And I can also assure you that, in my highly unbiased opinion, it truly is THE best gelato in Rome. In a future visit I will be happy to take you there—it’s in a big neighborhood and not that hard to reach with public transport. Meanwhile, feel free browse the others on the list and try to guess which, if any, I’ll pick for future stops. 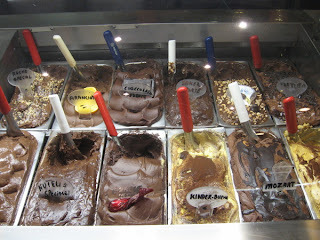 Hello, I was just in Rome 2 weeks ago and did a gelato tour myself... I have to say that out of all the places I thought the depth of flavor from Giolitti was the best. I was in Rome for 7 days and I had gelato twice a day almost everyday! snif. snif. That's me crying. Growl growl. That's my stomach growling. There is no gelato like gelato served in Italy. Almost no point in trying. My Grandpaw just took a trip of a lifetime to Italy this summer. You must understand that he loves two things: baseball and ice cream. I told him Grandpaw, you MUST have gelato EVERYDAY. Because it is Heaven on Earth." He was obidient and actually over the top having gelato several times a day! Ah gelato- the best food I had on my 16 city tour of Europe! When I lived in Rome I ate Gelato nearly everyday for nine months. I kid you not. I did walk a lot though. Shelley, will you mail me a cone of Niocolla if I guess that your favorite gelateria is Old Bridge near the Vatican. And if you've never been there, please stop what you're doing, stand up and go fix that! Ciao Richard! I checked out your blog--very thorough job of documenting your time in Rome. I heart the concept of your blog(s). Jane: Sorry, didn't mean to make you choke up there. Didn't Grandpaw bring any back for you? I know, there's that little problem of it melting and all. Oh well. Guess that just means you'll have to come here yourself to try it! Yum, yum, yum! In Phoenix, the best gelato is at a place called "The Gelato Spot." The staff wear t-shirts saying, "I hit the G Spot." Not so classy, but yummy dessert regardless. You didn't get Baci?! I guess I'll just have to come back and have some more myself. WHO KNEW they made Nutella flavored gelato - wonders never cease. And, yes, I would like to add the "Can only be reached by public transport" gelato place to my next visit. Thanks for stopping by! 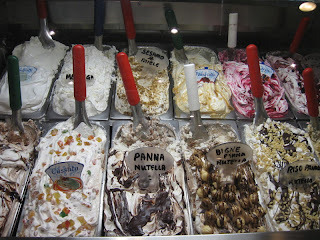 I just discovered your blog, too, and you're making me miss Italy like crazy (especially the gelato...). 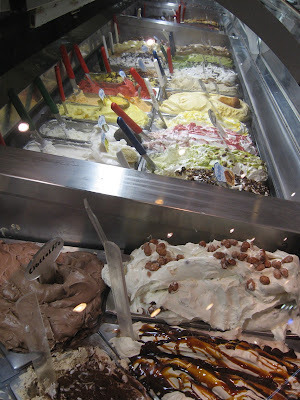 Before we moved to Zurich, we lived in Milan, where we performed our own intense study of local gelaterias. Best flavors ever: dark chocolate jalepeno, and plain old pistachio (at the right place, of course). 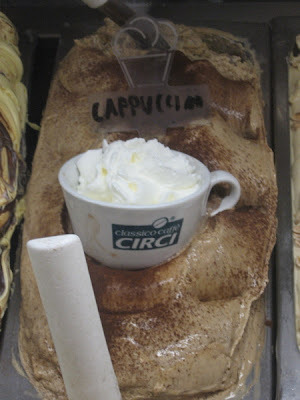 Once you get to Giolitti try the "riso" flavor. It's yummy. Somehow the bits of rice in the cream remind me of frozen rice pudding. I have to say that the Nociolla and the cassata siciliana are also excellent! Kel: Low class but yummy all the same. Funny stuff. I wonder how many people ask if they can buy one of those shirts. Maybe I don't want to know. Fin: I wanted to take you, in fact we could have gone that one day we went shopping at Castroni, but I think time ran short. Next time! Jul: Great to see you! The spicy dark chocolate is one of my ab-fab flavors ever. Richard: I've seen that before but never tried it... ok, on my next tour I'll give it a go! My favorite gelato shop (in Korea) closed a few months ago. Wow you make me miss it. They had corn-flavored, grape, green tea and Oreo . . . of course, it probably wasn't as good as yours, but it was so divine. Just heard that Della Palma will ship anywhere. Does anyone know how if they have a website?